Luis Enrique will be the eighth Club captain to become first team manager, joining a select group made up of José Nogués, Josep Samitier, Ladislau Kubala, César Rodríguez, Joaquim Rifé, Johan Cruyff and Josep Guardiola. Kubala is the only one of the group to have managed the side on two separate occasions. Luis Enrique joins Josep Guardiola as the only manager to have both captained the side and managed the B team, with Josep Seguer, Laureano Ruiz and José Luis Romero having managed both sides, but never captaining the first team. Fifteen other managers played for the first team before taking over – though never captaining the side: Jack Greenwell (manager on two separate occasions), Romà Forns, Ferenc Plattko (on two separate occasions), Josep Planas, Ramón Guzmán, Enrique Fernández, Ramon Llorens, Domènec Balmanyà, Lluís Miró, Josep Gonzalvo, Salvador Artigas, Lucien Müller, Carles Rexach, Toño de la Cruz and Tito Vilanova. José Nogués (Player between 1927-34. Manager: 1941-42); Josep Samitier (Player between 1919-32. Manager between 1944-47); Ladislau Kubala (Player between 1950-61. Manager between 1961-63 and 1980); César Rodríguez (Player between 1942-55. Manager:1963-64); Joaquim Rifé (Player between 1964-76. Manager: 1979-80); Johan Cruyff (Player between 1973-78. Manager between 1988-96); Josep Guardiola (Player between 1990-01. 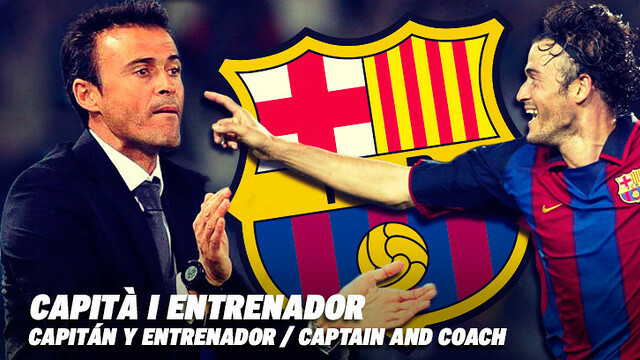 Manager between 2008-12); Luis Enrique (Player between 1996-03. Manager between 2014-? ).